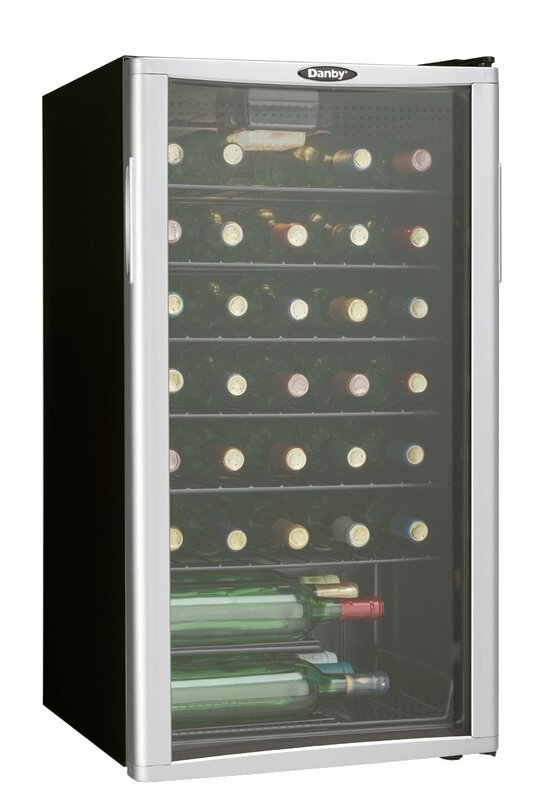 >> Danby Wine Cooler Reviews: Is This The Wine Fridge Line For You? Danby Wine Cooler Reviews: Is This The Wine Fridge Line For You? Maybe your collection of wine is growing and you don't want to leave it in your fridge. Or maybe you've learned about storing wines and have decided it's time to move to a wine cooler. 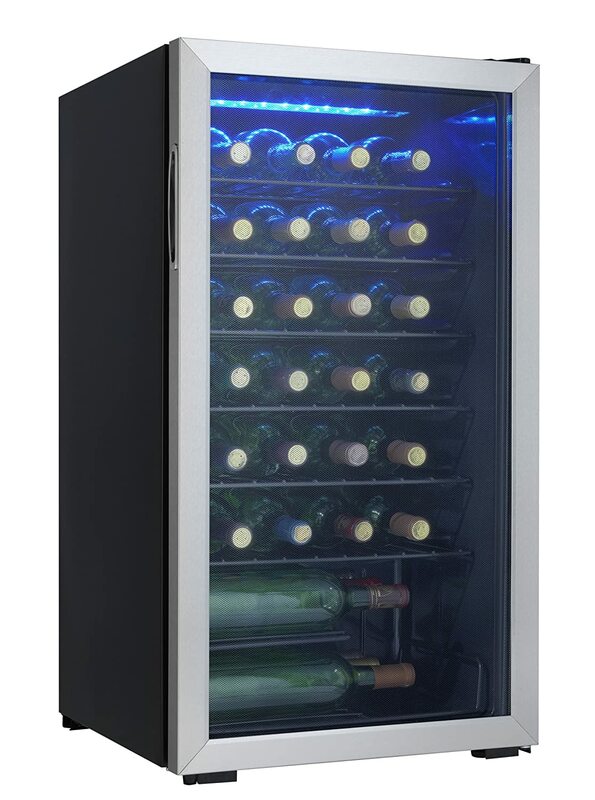 Considering a Danby freestanding wine cooler or Danby Silhousette built in? Never heard of Danby? 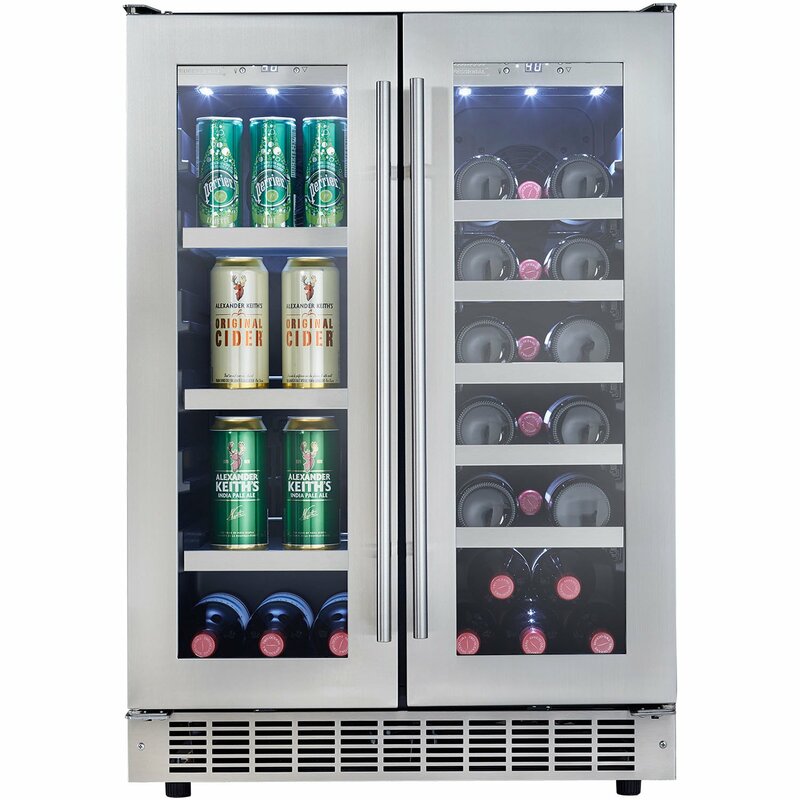 No matter where you are in the process of shopping for a wine cooler, our in depth look at Danby's products and these Danby wine cooler reviews can help you determine if Danby is the right brand for you and help you narrow down model. We looked at five different models from Danby - three freestanding and two built in - some of which hold canned beverages in addition to wine bottles. The summary chart below lays out Danby's main wine refrigerators, looking at popular details and sought after specifications. Below the chart we have more specific information about Danby Wine Coolers. What Do These Main Features Mean? While some of the features are self explanatory and some might sound fantastic we'll go through and explain what each one REALLY means, the benefits they bring to the table, and help you to narrow down the best options for your wine collection. Bottle capacity is based on the number of standard wine bottles a unit can hold. Larger bottles will require the removal of shelves, resulting in fewer bottles. While a large capacity sounds great, track how much wine you purchase and drink in a week for a while before buying a wine fridge. Running the unit costs money (utilities) and you may quickly realize that a 60 bottle capacity cooler is more than enough. You will want a little extra room because once your friends and family know you have a wine cooler, you'll probably end up with more wine! Quick Tip: What size to buy? If you're fairly new to the world of wine but want to build a collection, I recommend a wine cooler that holds at least 30 bottles. Wine coolers are an investment and you don't want to buy one that is too small only having to upgrade quickly. You also don't want one that is too big. Thirty bottles is a reasonable starting point for the budding collector and you can always put a smaller unit on top if you need more room to keep wine. Casual drinkers with no desire to collect should consider a smaller fridge. I'll never collect because I'm constantly sharing and drinking my wine but my twelve bottle wine cooler is definitely in need of a companion. HOW wine coolers are cooled makes a difference. When shopping you'll notice that they use either compression or thermo-electric cooling. 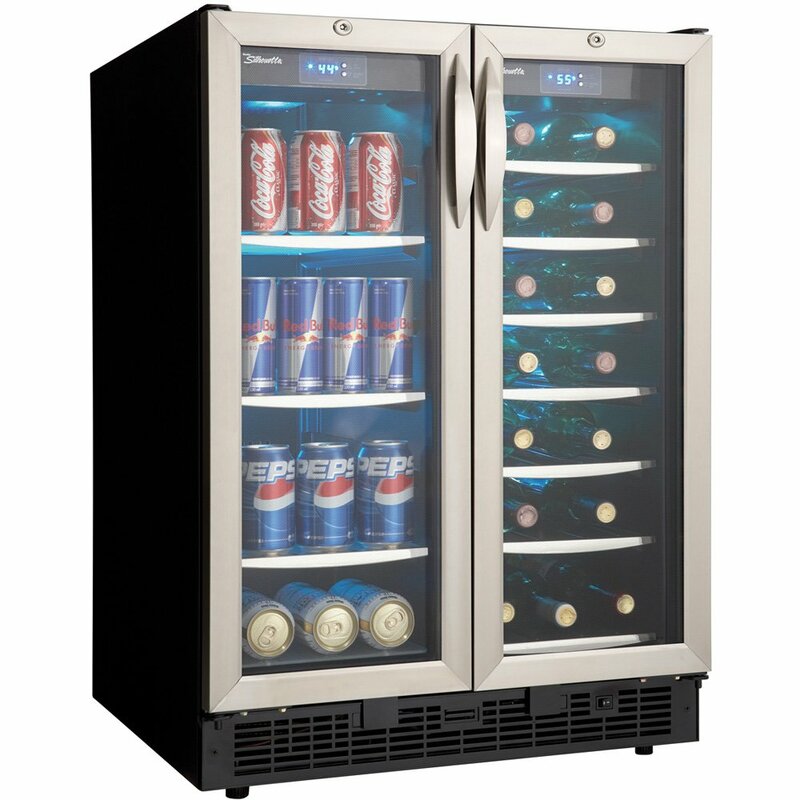 The Danby wine coolers listed here all use compressors but get to know the pros and cons for both - after all, you are making an investment and want to get the best cooler for your needs. Quick Tip: One of the most important things to consider when researching wine coolers is ambient temperature and how the ambient temperature will affect your wine. Ambient temperature is the temperature in the room with the cooler. If you live in a warm climate, like to keep your house very warm or turn the heat down very low at night the room's temperature will determine the range of temperature in your cooler. Especially if you're going to keep white wines very chilled, you'll want a wine cooler that is less sensitive to ambient temperatures. Like the name implies, some wine coolers have two different temperature settings while others have one. Dual-zone wine coolers are essentially two wine coolers in one. 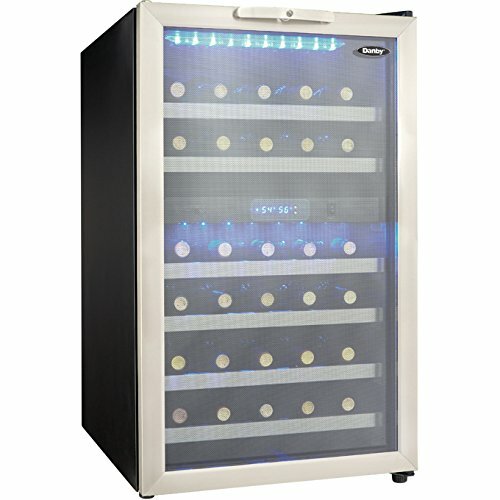 Dual-zone wine coolers allow you to store white and red wines at their ideal serving temperatures in the same unit. Single-zone units can only be set at one temperature and are ideal for storing only one type of wine, red or white. Quick Tip: Dual-zone wine coolers are optimal for most people with a wine collection. If you, your family, and your friends drink one type of wine a single-zone wine cooler will be fine. If not, a dual-zone cooler keeps two types of wines at their appropriate temperatures and can be enjoyed as soon as they are removed from the cooler. If you end up with a small fridge try to get one that will allow you to store at a low temperature -- that way you can drink your whites immediately. For reds, just let them sit out for an hour before drinking. 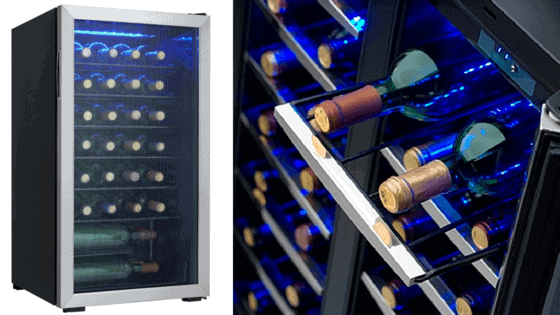 Most wine coolers come with tinted glass doors that are able to block UV light from affecting the stored wine. Sunlight can ruin wines so you want to always keep them out of sunlight. You don't have to worry with a wine cooler with tinted glass. In addition to adding protection from UV rays, the glass gives coolers a beautiful, classic look. All Danby models come with UV blocking glass. Danby started as a small, family run business manufacturing small electrical appliances. They started in Quebec, Canada in 1947. Danby has grown considerably and is now a household name in North America. The company is headquartered in Findlay, Ohio. Danby's head of operations is in Ohio and the company also has offices in the U.S. State of Massachusetts and in Canada. Their products, however, are manufactured in China. Danby® manufactures appliances under a variety of names both using Danby and also the single monikers of Simplicity®, Arcticaire®, and Silhouette®. Danby® also contracts to produce private label brands for retailers. What's Wine Turtle's take on Danby? Here's Danby at a glance. Most customer reviews include many malfunctions and bad customer service. Summary: While looks are definitely important, they seem to be the best part of Danby's product line. Most user reviews include multiple malfunctions, and difficulty working with the company to have these issues remedied. When reading reviews it is important to consider that they will not all be true and to get the best sense of Danby's products we did not count the absolute best reviews or absolute worst; the ones in the middle all refer to these problems. There is a large variety of freestanding and built in units, all of which are beautiful. Wine Turtle's recommendation to Danby would be to improve the customer service side of their business. That would make any mechanical issue, which we completely understand happen, more palatable to customers. Compressor-based Cooling Mechanism - We prefer wine fridges with compression cooling, so Danby automatically scores points with us for that. Temperatures can go lower and the unit is less sensitive when it comes to ambient temperture allowing you to keep the temperature of your wine far more stable than a thermo-electric wine cooler. The Look - Danby's fridges have a sleek, sophisticated look that works whether built into a kitchen or freestanding in a wine room, cellar, kitchen or even living room. wine refrigerators is quite extensive with a fairly large selection available in terms of both sizes and styles. Standard Bulbs - Some Danby wine chillers use standard light bulbs and we strongly advise against purchasing a wine chiller with these bulbs. It is more common to find LED bulbs in wine chillers. Why? LEDs (light emitting diodes) are the most sensible option for a few reasons: they have a long life span and are energy efficient but it goes far beyond that. Standard bulbs are sensitive to cold and humidity. Wine coolers are cold and humid on the inside. Additionally, standard bulbs emit far more heat than LEDs - something you definitely don't want in your wine fridge as it's counterproductive and also requires the machine to run more due to the warming. Complaints About Service - Most reviews of Danby include significant complaints about customer service. While mechanical issues are understandable and a natural part of owning appliances, reviews cite difficulty working with Danby to have these issues resolved. Comments such as "non existent customer service" are alarming, especially when investing in a piece like a wine chiller. There are quite a few reviews that refer to malfunctions so this, in concert with the bad customer service, is a problem. Noise - Wine chillers with compression cooling systems will produce more noise than their thermo-electric counterparts but the payoff of less sensitivity to ambient temperatures and being able to get colder are worth it. Finding a place in your house away from bedrooms, if you have super light sleepers, or placing it on a small rug or in a carpeted room can also help significantly. For wine lovers looking to keep on hand a small collection of bottles, say under a dozen, we recommend a smaller, thermo-electric unit with LED lighting to start off. If you're looking to build a collection or are serious about wine, consider a arger capacity, LED lit compression-based wine cooler. Be sure to research as many brands as possible by reading our reviews and also checking for updated reviews on sites like Amazon to make the best, most educated selection for your wine cooling needs.